New Zealand just released its quarterly employment report for Q2 2015 this week and boy, oh, boy did it turn out to be a huge disappointment. Not only did the actual reading of 0.3% fall short of the expected 0.5% gain, but the previous period’s report also suffered a downgrade from 0.7% to 0.6%. The jobless rate climbed from 5.8% to 5.9% as expected, reflecting that a larger percentage of the working-age population are unemployed. To make things worse, the participation rate fell from 69.5% to 69.3% during the quarter, indicating that people are exiting the labor force and giving up on their job hunt. On a more upbeat note, average ordinary time hourly earnings chalked up an annualized 2.8% increase while wage inflation (which includes overtime pay) saw a healthy 1.6% year-over-year gain. But even if people are making more money and salary growth is outpacing New Zealand’s 0.3% annual CPI by a mile, the rising number of unemployed blokes might still end up weighing on consumer spending and overall economic growth. Based on the outcome of this week’s Global Dairy Trade (GDT) auction in New Zealand, the dairy industry is still down in the dumps with another drop in prices. 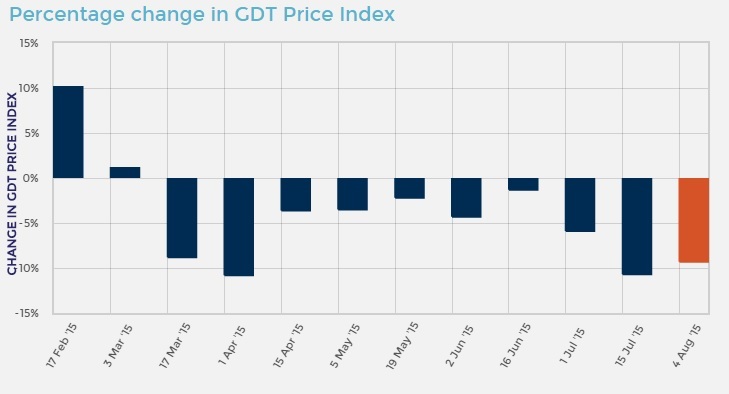 The GDT index, which is the weighted average price of nine dairy products sold at the auction, chalked up a nasty 9.3% tumble. That’s its tenth consecutive drop so far this year! With that, dairy prices are down by nearly 50% from their highs in February 2014 since supply and production levels have increased in the U.S., China, Russia, and Belarus. If you’re wondering why forex market watchers are making a big fuss about all this, lemme tell you that dairy shipments make up nearly a third of New Zealand’s total exports, which then account for around 30% of the country’s GDP. Aside from that, declining dairy prices translate to lower payouts to milk farmers, which means lower revenues and income. This could prompt dairy producers to scale down operations and hiring activity to adjust to weaker demand and lower profits. That’s shaping up to be a dismal year for Fonterra, which is New Zealand’s largest company and the world’s top dairy exporter. Try as the Chinese government might to put a stopper on the equity market bloodbath, there’s no denying that the world’s second largest economy is facing a gloomy outlook. Unfortunately for New Zealand, China is its biggest customer for whole milk products. According to a report by the U.S. Department of Agriculture, China is projected to buy only 400,000 tons of milk powder this year, down from the 671,000 tons imported in 2014. Dairy exports from New Zealand to China are down 65% through May and could see further declines in the succeeding months. 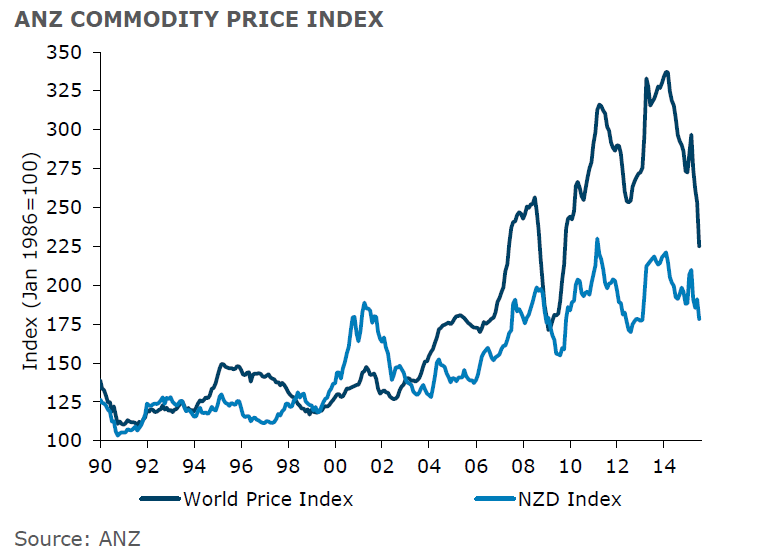 As though the downturn in the dairy industry ain’t bad enough, New Zealand could also suffer from another leg lower in commodity prices, which might put downside pressure on inflation and force the RBNZ to cut interest rates again. Earlier this week, ANZ reported a jaw-dropping 11.2% tumble in the average price of the nation’s main commodity exports for July, following June’s 3.1% decline and May’s 4.9% drop. Of course dairy products (-23.1%) were mostly to blame for the drop, as prices are down to their lowest level in 11 years. Aluminum prices were down 2.6% on a monthly basis while forestry products showed a 2.2% drop in prices for July. The report even went on to show that the recent Kiwi depreciation did very little to stem the decline in commodity prices, as the currency-adjusted index still churned out a 6.7% drop – its third largest tumble since the series started in 1986. Unlike the RBA which already acknowledged that the Aussie is adjusting to lower commodity prices, RBNZ officials might not be opposed to the idea of further jawboning or forex intervention.